A mother seeks vengeance for the death of her son. Swiss director Frederic Mermoud is probably best known for his work on French TV's acclaimed zombie drama The Returned. 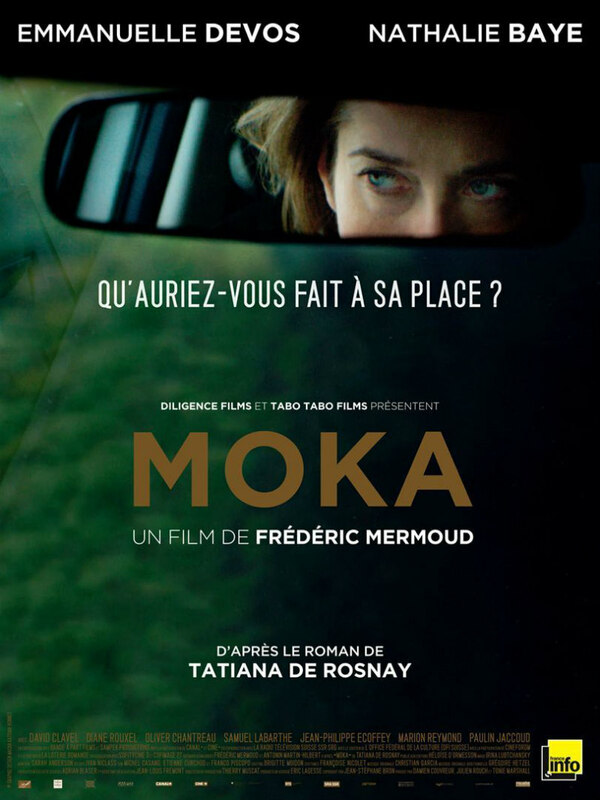 For his second feature film, he reteams with the star of his 2009 debut Accomplices, Emmanuelle Devos, for an adaptation of Tatiana de Rosnay's novel Moka. The title refers to the coat of paint on the car involved in a hit and run which resulted in the death of the son of Swiss resident Diane Kramer (Devos). Along with a witness noting it was driven by a woman, the vehicle is the only clue Diane has to finding the culprit. When a private investigator informs her he has located what may be the car in question across the border in the French town of Evian, Diane takes over the investigation herself. Relocating to Evian, Diane discovers the car is up for sale by its owners, aging beautician Marlene (Nathalie Baye) and her younger husband, swimming instructor Michel (David Clavel). Diane uses her feigned interest in purchasing the car as a means of getting close to the couple, spending time in Marlene's salon, taking swimming lessons with Michel and stalking the couple's teenage daughter Elodie (Diane Rouxel). When she purchases a gun on the black market, her intentions become all too clear. For a movie made by a director coming off a TV show, Moka is pleasingly visual in its narrative. Diane is largely silent throughout, spending most of her time spying on the would be targets of her vengeful rage, be it in the cobbled streets of Evian or across the dancefloor of the packed nightclub their daughter frequents. It's a challenging role for Devos, who is an actress I have a lot of time for (I highly recommend checking out her turn opposite Gabriel Byrne in Jerome Bonnell's Just a Sigh), but she doesn't seem up to the task of conveying the specific psychology of her troubled character here, and I couldn't help but ponder how more engaging Diane might be if played by Juliette Binoche or Kristen Scott Thomas. The movie's strongest scenes are those in which Diane spends time with Marlene, the latter played by Baye as a sympathetic and quietly tragic figure, which goes a long way to making us question if Diane is on the right path. But there aren't enough of these moments. Instead, time is wasted on a pointless subplot in which Diane begins an affair with the young hustler who arms her with a pistol. Marmoud does just enough behind the camera to suggest he's capable of giving us a compelling Chabrol-lite thriller, but more time spent mining the skills of his leading ladies and a narrower focus from the script may have gone a long way to making Moka a more involving drama than the lifeless thriller that ultimately made it to the screen. Moka played at the Audi Dublin International Film Festival. A UK/ROI release has yet to be announced.